Lucky Bamboo turn yellow if the basic care tips for the lucky bamboo plant are not considered or followed. Lucky bamboo and their stalks should be a healthy looking green colour, not yellow and sickly. However, this is not always the case when we take them out of their natural environment and keep them in our homes. If your Lucky Bamboo has all of a sudden changed from the healthy green colour that it should be to a yellow this could be caused by some of the reasons outlined below. They have become very popular as house plants and do have a reputation for being ideal for people who do not have a lot of knowledge about plant care. The reason for this is that they are considered to need very little maintenance and are therefore more likely to survive if you don't have very much time to care for them. It is true that they can survive in low light and this is because they come from a natural environment where they are growing under a natural canopy and therefore thrive in lighting that is filtered or shady. However, they are not to be considered as indestructible and they do require an amount of care to ensure they don't get sick or just die. The following are some of the Lucky Bamboo care reasons that could make yours turn yellow but the first stage is to ensure you buy a healthy one in the first place. 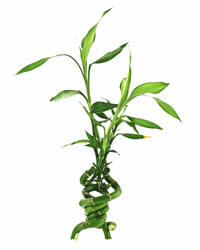 Care of Lucky Bamboo plant does not involve leaving it in an environment where the temperature is too low. Lucky bamboo will not maintain good health in a cold temperature. They need to be in a room that you find to be a comfortable temperature. If you feel chilled in the room your plant will most likely be feeling colder than you and will lose condition. As they are tropical, success in their care is very dependent on keeping them in the right temperature. An environment that is warm and set at a temperature of approximately 60 degrees is ideal. If you expose it to sudden draughts or cold all or one of the stalks of lucky bamboo turn yellow and at that stage is almost always impossible to bring it, or its stalks, back to good health and a green colour. To remove the stalk that has turned yellow, move it to a warmer environment, and hope that the other stalks were caught in time to prevent the same thing happeneing to them. Find a healthy green and firm part of the stalk, or stalks, cut them around an inch above the healthy and closest node and try to create a new one from the cutting by re-rooting it. The old lucky bamboo part that turned yellow on the original plant is no good as it is probably dead or dying anyway, and can just be thrown away. Get some rooting hormone from your garden centre, put the stalks into a clean pot or container to ensure the yellowing was not caused by disease, and ensure you use fresh clean water that is not chlorinated. Do not fertilize until the stalk has established. In their natural environment Lucky Bamboo grow underneath a canopy of larger vegetation and trees. The branches and leaves overhang and therefore the Lucky Bamboo do not receive any direct sunlight. The lighting that filters down is dappled shade and this natural environment needs to be duplicated in your home to ensure the plant does not get direct sunlight and will survive. Direct sunlight from a window will burnit, the leaves of Lucky Bamboo turn yellow, eventually going to a brown and this will be followed by dying off. Ideally they should be situated in a brightly lit room but must not be in contact with any direct sunlight coming in through a window. Definitely do not place them on the windowsill! We can be a bit too keen to fertilise house plants and this will also then often result in actually killing them instead of making them more healthy. You need to ensure that you do not over fertilize, they can be particularly susceptible to being over fertilized because they are in pots. The fact that they are in pots means it is often better to use a very weak solution of fertilizer when you do use it. If the dose of fertilizer is too strong this could also make Lucky Bamboo turn yellow. Be sure to read the instructions, fertilise at the correct frequency between doses, and measure the feriliser ratio accurately and not just by guessing. Do remember that your plant will need clean water at recommended intervals. See the instructions that you should have had when you bought it. The best water to use will be fresh spring water or rain water as it will not contain the chemicals in tap water such as chlorine. This is also a factor in helping prevent Lucky Bamboo turn yellow. When topping up the water that's in the container do try to maintain it to the same level. The roots of Lucky Bamboo form at the line of the water. If you raise or lower the level of the water, they will grow more roots at the higher water level which may not be the result you want. They do very well in water and can therefore actually be grown in an indoor water fountain. This is a great display to have in your home, two features combined into one.